Follow I-95 to the Washington Beltway system and exit west onto I-495, Silver Spring. Follow 495 to the Connecticut Ave exit. Take Connecticut Ave south toward Washington. About 5 blocks after Connecticut crosses Military Rd, turn right onto Nebraska and follow to Wisconsin Ave. Go south (left) onto Wisconsin Ave. Stay on Wisconsin and cross Massachusetts Ave staying in the left lane. Turn left at the first light and follow to Massachusetts Ave. Turn right onto Massachusetts Ave. St Nicholas is approximately one block down on the right. Follow the Parkway to Rt 50, exiting Rt 50 west onto New York Ave. Follow New York Ave until it intersects with Massachusetts Ave at 7th St NW. Switch onto Massachusetts Ave and follow it to St Nicholas Cathedral on the left (approx. 1 block after the Vice Presidents residence, the Naval Observatory). Follow I-395 toward Washington. Approaching Washington, follow signs for the Memorial bridge. Cross the river staying in the right lane. Exiting the bridge follow the right lane and curve down onto Rock Creek Parkway. Follow Parkway to Massachusetts Ave exit. Exit to light, and turn left onto Massachusetts Ave. Follow to St Nicholas Cathedral on the left (approx. 1 block after the Vice Presidents residence, the Naval Observatory). Follow I-66 east to Washington crossing over the Roosevelt Bridge. Stay in the left lane: exit left. Keep to left following signs to Kennedy Center and Rock Creek Parkway. When road ends, turn left, then almost immediately turn right and then again right onto Rock Creek Parkway. Follow Parkway to Massachusetts Ave exit. Exit to light, and turn left onto Massachusetts Ave. Follow to St Nicholas Cathedral on the left (approx. 1 block after the Vice Presidents residence, the Naval Observatory). Get a bus transfer! Take the red line to Dupont Circle and use the Q St exit to 20th St, turn one block to Massachusetts Ave. Turn left and go 1/2 block to the bus stop. Board a bus marked N2, N4 or N6 (Friendship Heights) to St Nicholas Cathedral on the left, approx. one block after the Vice Presidents residence, the Naval Observatory. Parking for St Nicholas Cathedral is on side streets around the Cathedral. Parking is limited to two hours, 7 AM to 6:30 PM M-F, except for holidays. St Nicholas Cathedral Office is open from 10 AM to 4 PM Monday through Friday except during weekday Liturgies and on Saturdays from 1-4 PM. 5:00 PM Vigil (English and Slavonic). 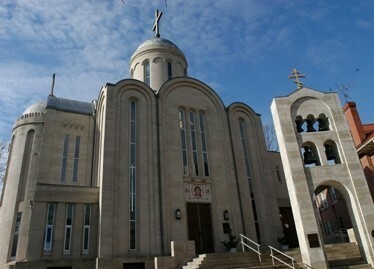 9:00 AM Divine Liturgy (English); 10:45 AM Divine Liturgy (Slavonic). 9:00 AM Divine Liturgy (combined languages), Feasts and Special occasions. 10:00 AM Divine Liturgy (English and Slavonic). Confessions are heard before or after Vigils, or by appointment. General Confession in English is celebrated on the 1st and 3rd Saturday of the month, after Vigil. General Confession is Russian is celebrated on the 2nd and 4th Saturday of the month, after Vigil. General Confession is not celebrated between Pascha and Pentecost or Christmas through Epiphany. Founded in 1930, as the Russian Church of St Nicholas, the parish was originally located on Riggs Pl in northwest Washington, DC. The first pastor was Rev John Dorosh who lived above the chapel. In 1934 the Dormition Sisterhood and the Nation’s Capitol “R” Club were formed. In 1935, the parish moved to 1708 Church St, also in northwest Washington just a few blocks from Riggs Pl. In 1938, Fr Paul Lutov replaced the retiring Rev Dorosh. Fr Lutov helped to introduce English into parish services to ensure that the Word of God could be understood by everyone. After WW II, Fr Lutov left his post as rector although he remained active in the parish. St Nicholas’s rectors from 1948 to 1951 were Monk-Priest John (Morozov) and Fr Nicholas Makovelosky. The parish had grown to 100 members by about 1950. In 1951 Metropolitan Leonty blessed the newly purchased site at Massachusetts Ave and Edmunds St, our current location. In 1955 after the death of Bishop Jonah (rector), Archpriest Arkady Moiseyev became Rector of St Nicholas Church. Fr Moiseyev guided St Nicholas through the building and dedication of our current facility. The edifice was completed in late 1962 and was dedicated as a National War Memorial Shrine in 1963. Over the years, St Nicholas Cathedral has had many dedicated clergy serving our church. With the elevation of St Nicholas to the Metropolitan’s Cathedral Fr Arkady Moiseyev became Dean and Fr Dmitry Grigorieff Provost. In the early 70’s, Fr Dmitry was very active in ensuring that there were regular English Liturgies. In 1986 Fr Dmitry was elevated to Dean of the Cathedral and Fr Constantine White became Associate Pastor. In February 1998 Fr Dmitry became Dean Emeritus and in December 1999 Fr Constantine was installed as Dean. Fr Dmitry has retired but continues to live in the area and has remained active in our parish community. Fr Valery Shemchuk joined the Cathedral as Associate Priest in November 2002. St Nicholas has always had a very active Choir. Mr Nicholas Borodulia was the choir director from 1955 to 1985. From 1996-2002, Professor Serge Boldireff led the choir to a more visible role. The choir has sung the responses at Liturgies celebrated by Patriarch Alexei II of Moscow, Patriarch Ilia of Georgia, Metropolitan Sawa of Poland, and at St Vladimir’s and St Tikhon’s Seminaries, and more recently at the Enthronement of His Beatitude, Metropolitan Herman. The St Nicholas Sunday School was first organized in 1950 and continues today with an enrollment of about 25-30 children. Sunday School in English is held in the parish annex immediately following the English Divine Liturgy on Sunday mornings from Labor Day through Memorial Day. Church School in Russian is held at 9:30 AM on Sundays at the parish annex. For more information, please contact the Cathedral office. In 1991 St Nicholas Cathedral was honored to have a group of dedicated iconographers arrive from Moscow led by Alexander Moskalionov who wrote icons throughout the Narthex in traditional style. Several new icons were created commemorating the arrival of Orthodoxy to America as well as the tragedies in Russia in the early part of the 20th century. This project was completed in the fall of 1994. A new iconostasis was made to complement the iconography and was installed in 1995. The church is open for tours and visiting for groups of more than 10 upon request. For groups of less than 10 we encourage you to visit before or after a regularly scheduled service.